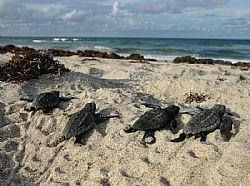 Today, the Florida Fish and Wildlife Conservation Commission (FWC) announced a record year for the number of green sea turtle nests in Florida. FWC staff documented approximately 39,000 green sea turtle nests, based on 27 Florida index beaches used to assess nesting trends. For more information about trends in sea turtle nest counts on Florida beaches, visit MyFWC.com/Research.